When it comes to landfill compaction, a smooth surface is key to ensuring daily cover is applied in a safe and cost-effective manner. It’s precisely the reason why Ace Environmental Services (ACE), which operate the Grantville Landfill and Transfer Station in regional Victoria, has continued to invest in compactors by original equipment manufacturer TANA. 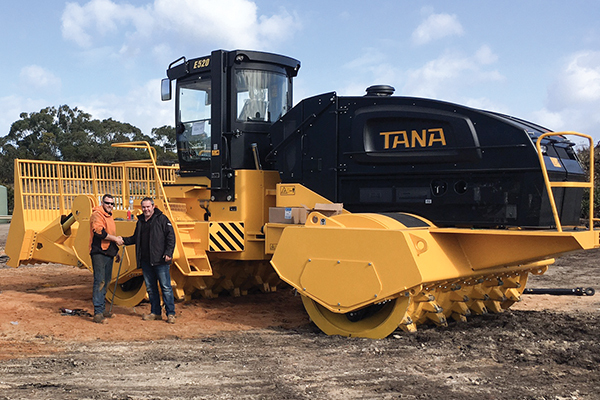 ACE recently purchased its second TANA machine, the E520 compactor, available through exclusive Australian distributor GCM Enviro. The pressures for ACE to operate efficiently are high, as they have been contracted on behalf of a local council, under a performance-based contract measured in tonnes per m³. It means an efficient compaction rate is needed to ensure ACE meets its client’s objectives and requirements. Trevor Ryan, ACE site manager, refers to the E520 as the Mercedes-Benz of the fleet, as each operator is able to customise their own desired speed and reaction time by inserting their own customised USB key when operating, maximising efficiency for all. The TANA E520 compactor goes hand-in-hand with ACE’s tarpaulin-based alternative daily cover system by tarpARMOR, as the E520 provides an even surface to help team members lay the tarpaulin down each day. “The whole package has made a huge difference to our operation, particularly with regard to pack up time and utilisation of machinery on site,” Trevor explains. Uneven compaction carries with it several risks, including ripping the tarpaulin-based cover and having staff walk on uneven surfaces on-site. Grantville Landfill processes approximately 23,000 tonnes of waste per year. Due to its smaller size and high coastal population increases over holiday periods, Grantville Landfill experiences peak periods of traffic. For these reasons, ACE invested in a larger machine capable of processing more waste at once. The TANA E520 features two full compaction drums which provide a full width compaction and even surface. The end result provides Trevor with a conservative compaction rate of at least 850 kg per m³, depending on the waste composition. Trevor says because of the dual compaction drums, the machine is able to provide an even surface in four passes instead of an industry standard of six, reducing machine hours, operator costs and fuel consumption. A bigger foot on the compactor is also shaped for better self cleaning, which lowers fuel consumption. Trevor estimates the E520 has saved him approximately 15 litres an hour when compared against older compactor models. A rigid frame maximises the crushing force of up to 50 per cent of the total compactor weight, compared to 25 per cent for an oscillating frame, according to GCM Enviro. The rigid frame also means waste spreads in level layers, which maximises uniform compaction, instead of being spread unevenly along the surface through an oscillating frame. The end plates on the drums of the TANA machine eliminates any waste extrusion experienced in the eight points of four-wheel compactors. The drum design concentrates pressure directly under the frame, providing a smooth and level compaction. GCM Enviro says the E520 ground clearance is at least double that of any other compactor in the Australian compactor industry, with a height of 890 mm from the ground, while still maintaining a low centre of gravity. This is also important to prevent rubbish from getting trapped around the underbelly of the machine and posing a potential fire hazard. Stability is also ensured through a maximum sideways tilt angle of more than 50 degrees and minimum cabin sway due to a rigid frame. It’s particularly important for safety, preventing the risk of rollover for the operator. Another prominent consideration is the vision of the cab. Trevor says the E520 offers a 360-degree view of the site. The cabin is mounted in the front of the machine as opposed to the back, which provides full visibility for the operator to the bottom of the blade. But with all these factors in mind, keeping the machine in working order is perhaps the most important. ACE says a key consideration for working with GCM Enviro was their ability to offer a 10-year maintenance contract. Should there be any issues, GCM Enviro asserts that it can get on site within 24 hours and have the machine back up and running in 48 hours, anywhere in Australia. “GCM Enviro has assisted us promptly in the past when we’ve had machine break downs,” Trevor says.